How to Learn Arabic Language Quickly and Fast? Learning a new foreign language is never easy. Yet if you put your mind to it and really give your best then before you know it, you will be able to pick up the language. When people are narrowing down on the languages they would like to learn, very often they choose languages such as French, Greek, Spanish and even Hindi. It is rare that people will attempt to learn Arabic since it is not known as the easiest language to grasp. If you think that you have what it tasks to not only get a hold of but also master the language then here are some ways on how to learn Arabic language up quick and fast. 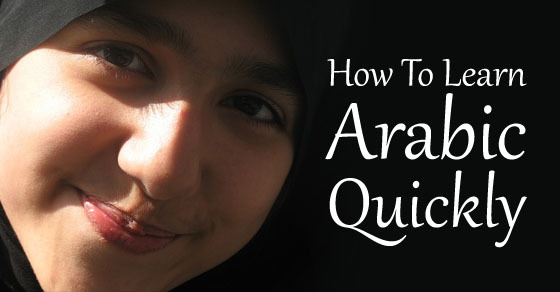 The following mentioned are a few tips on how to learn Arabic language quickly and easily. Previously everything was done manually and technology was not very well developed. Yet we live in an age where technology has made things very easy for us and you should put technology to the maximum use and get the most of it. If you have a smartphone or a tablet, then you could consider downloading an app or two which will help you to get a hold of the language quickly as well as easily. If you are not sure about which app to choose, then you can browse the net and find out the top apps for this purpose. In addition to this, using good old Google Translator will also help you immensely. If you take things lightly and while away your time doing nothing, then you will never be able to master the language with ease. In order to speed things up, you should ensure that you set aside some distinct hours a day to study. Simply donating an hour or two per week will certainly not be enough. It is only after much concentration and dedication that you will be able to make a scratch on the surface. It is not for nothing that many people across the globe have tried their hand at learning the language, but only a few have managed to succeed at it. It is not very easy to find a good tutor who is fluent in Arabic. Finding a teacher is merely half the battle won, you must ensure that the person can teach and is methodical in her manner of teaching. It is advisable that you employ someone who has a bit of experience and will be able to give you the guidance which you require. If you employ someone who is himself unsure of the language then chances are that you will not be guided properly and you will not be able to make steady progress. Employing a tutor will not be expensive, so it is a good option. The best way to proceed would be to tell your teacher to make a distinct plan of action for you so that you can follow it perfectly. Having a distinct goal in mind is bound to help you along the way and allows you to have something to work towards. If there is any ambiguity involved, then your interest might start to waver and you might also take longer to learn things than you otherwise would have. So go according to the plan, one step at a time and do not try to be overly ambitious as this is going to do nothing but confuse you. You can also consider taking the help of social media to help you learn Arabic easy. Each day many of us end up spending a number of hours browsing through our newsfeed or timelines. So wouldn’t it be great to actually learn how to speak Arabic or a little bit of Arabic when doing so? Simply change your language settings on these social media sites. When you do this you challenge yourself a little bit as you know what is positioned where, but you just get acquainted with the Arabic counterpart for words like ‘profile’,’status’, picture’ or ‘video’ etc. Words like this have certainly become an indispensable part of our vocabulary and learning their Arabic form is useful. All of us have an internet connection available at home and we can learn a new language at the comfort of our own homes via our computers. All you need to do is search for some online Arabic lessons or classes which are available and which can help you learn the language quickly as well as easily. Some of the courses will be available for free so you can go through them, but the better and more reputed ones are likely to cost you a nominal amount. So if this is something you really want then you should not have a problem paying through your card and spending the amount. Spend the money and in time to come, you will reap rich dividends. Music is often considered as food for the soul, Arabic music is popular all over the world because it is so beautiful and touching. Initially it is unlikely that you will understand any of the lyrics, at such a time all you can do is just soak in the music, yet over time, as you pick up the language you will be able to listen to the lyrics and understand every word that is sung. This is an exercise which many people who are trying their hand at learning a new language perform. They write down whatever they understand of the song and then inquire with their tutor or online about whether they were right or not. Another thing you can do is read an Arabic newspaper and see whether or not you are able to understand what you read. To help you, try purchasing a newspaper where the print is big and clear so that you do not have much difficulty. The best part of using this technique is that, the language of a newspaper is always correct and simplistic so that is why you are able to learn a great deal through this medium. Take some time out of your schedule to read the paper from cover to cover, as you get better you will not need much time to do this and you will read the paper in a matter of a few minutes. There are plenty of books which are available that you can purchase in order to help you learn Arabic fast and well. Reading these books closely will really be of great assistance to you. A book which you should make it a point to buy is an English to Arabic dictionary. At times if you think your app is not serving the purpose well enough, then having a dictionary handy can help you a great deal. This is a tried and tested method which has been used in order to pick up a language. One of the best things which you can do is make a group of like-minded people who also aspire to learn the language quickly and well. Doing things in this group is very effective as you will be able to put into practice whatever it is that you have learnt. You and your group members can compare notes and even suggest some videos which have helped them getting a firmer grip on the language. Group studies have proved to be highly effective as a method of studying. Your group can consist of as few as three to four people. Joining a class at a reputed Language school is very helpful indeed. Going to a school like this might cost a considerable amount, but it is certainly worth it as the methods and techniques you use will be highly credible and effective. Once your teacher has taught you a significant amount, certain tests will also be taken. When you are made to compete with others you automatically perform much better. You can either choose to adopt a tutor as mentioned above, or do this. You know best which study method will suit your needs best. One of the most important things to be kept in mind when learning any language especially Arabic is that you must keep your eyes and ears open at all points in time. Arabic is a language which has a number of nuances and more important than knowing the words is knowing how to pronounce the words. In order to get a hold of the complex pronunciations, you must ensure that you practice saying the words out loud when studying. There are also some DVD’s or CD’s which can be purchased that can help you in terms of your way of speaking. An effective thing you can do is ask your TV cable provider to give you some Arabic channels which you can browse through in your spare time. You can watch some Arabic serials which have subtitles and see if you are able to understand what is going on when you turn off the subtitles. In addition to this it is a very good idea to get some arabic news channels which broadcast the news in Arabic. Doing this is bound to help improve your spoken language. These are few easy tips for language learning. Staring from the bottom and gradually making your way to the top is a very smart thing to do. You can buy a few children books which are in Arabic and you will be able to pick up simple words and phrases with great ease. In such books to learn arabic, the words are accompanied with pictures so you will benefit a great deal from such pictorial representations. Books like these are very cheap and easy to avail of. Along the way there will be a number of times where you will feel like giving up especially when you think that you are not making any significant progress. Being optimistic is very important as your frame of mind determines how fast you will be able to grasp the language. You should try your best to make your knowledge holistic. It is a great idea to familiarize yourself with the Arabic culture so that things become not merely easy for you but also fun and interesting. Lastly, every language has its own formal structure. Once you learn about the structure of the language and the manner in which verbs and nouns are placed within a sentence then things will be fairly simple for you. Being grammatically sound is tremendously important if you wish to master a language. Leaning Arabic quickly is bound to be of immense help for you because it is a language which not many people are able to master. Once you learn the language then you can think of a number of ways to get maximum use of it. If you have the knack of picking up a language quickly, then you should pick up as many languages as you possibly can. Your ability to master languages is bound to take you ahead in your career and open several doors for you.